The Sound Guy, Inc. is holding a Happy Days Are Here Again (Maybe) Extreme Group Buy (formerly the Scary Economy Halloween Extreme Group Buy). From now until November 15, customers can get SFX Machine RT (normally US $75) and ReSpatializer (normally $50) together for less than half the cost of SFX Machine RT alone. 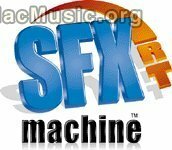 SFX Machine RT is a multi-effects and sound design plug-in for VST and Audio Unit. It includes hundreds of presets and is streamlined for quick and easy use in audio production environments. It has been used to do sound design for radio production, TV shows, feature films, CDs and video games. While SFX Machine RT has an unparalleled collection of effects, from the conventional to the bizarre, it also serves in everyday use as a "swiss army knife" of audio utilities. ReSpatializer is an advanced panning, surround sound and spatialization plug-in. It supports up to eight input channels, each of which can be individually panned.